Pretty Purplexing: Wishing you a Very Merry Day! It was a blast making the gingerbread house with the kids. The house would not stay together, and the walls kept falling in. Of course the kids laughed hysterically every time it happened. The fun began when they got to decorate the house. Once they figured out the could lick the icing off the house… well let's just say I had a lot of sticky fingers to clean afterwards. 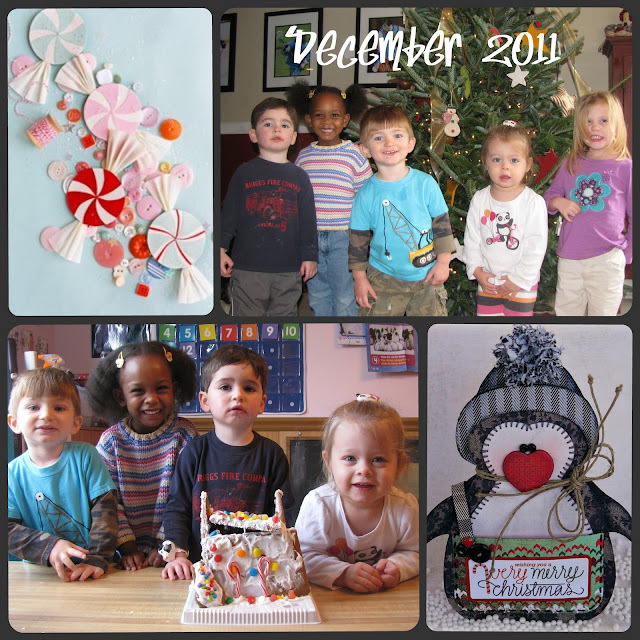 Check out my Day Care Blog for more pictures. Ah!! They are too sweet....all those smiling faces! Have a wonderful weekend! Too cute for words, the bunch of them. GREAT photo with the house. Tickled the falling walls made them hysterical. Gingerbread houses have never been my forte. Never, ever had one hold together. Glad to know I'm not alone. LOL Take care and keep having FUN. What a bunch of cuties, and I love the gingerbread house!